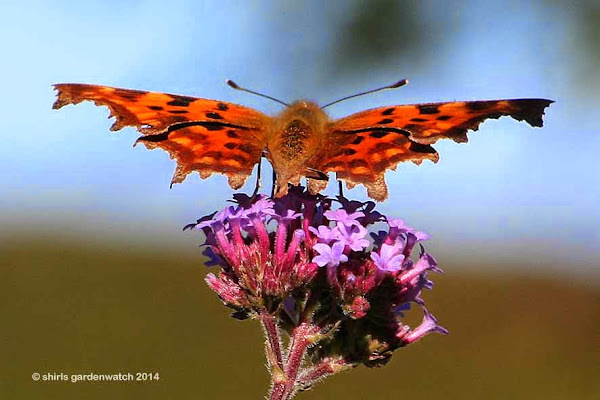 Perched high up on the small, dense flower clusters of Verbena bonariensis, in my back garden back at the end of August, the Comma butterfly looked like an aircraft about to take off. It’s easy to see how nature could influence engineering design isn't it? Tears filled my eyes as I looked through my camera lens taking record shots of this returning garden visitor. 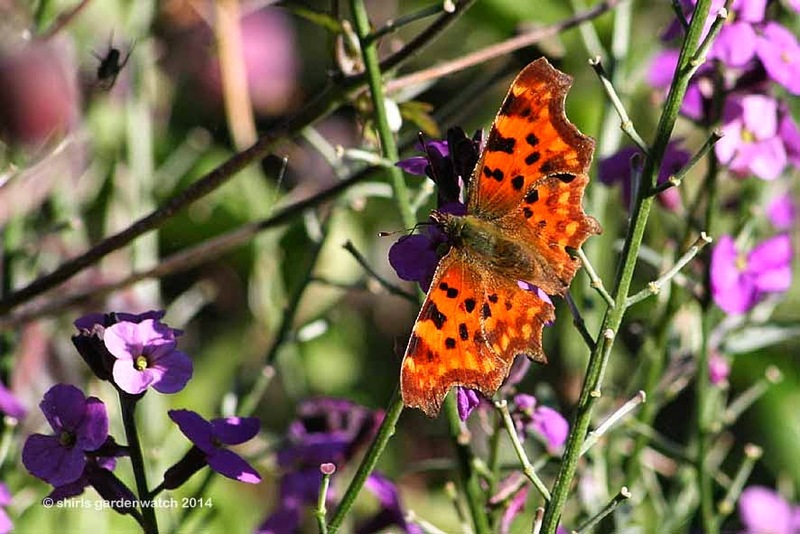 Three days after my Dad died, September 2012, the Comma butterfly was seen visiting my garden for the very first time. I instantly made a spiritual connection with it and dearly wished to see it return one day. The timing of the Comma’s return really caught me by surprise. I was filling the kettle at breakfast, having thoughts of my Mum in hospital with a misbehaving heart after her hip op., when something caught my eye through the window… and there it was swinging high on the verbena! 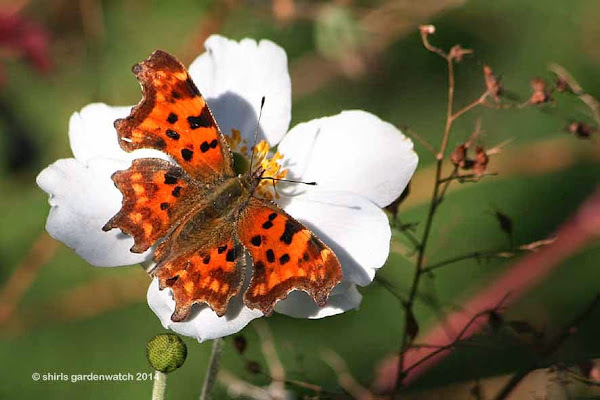 Another surprise with the Comma butterfly was that it was seen feeding on the Japanese Anemones and Astrantias – I hadn’t noticed other butterflies feeding on these plants before. As on its first visit, the Comma was only seen feeding for one day. Last time it was seen in my front garden almost a month later in the year feeding on Sedum. I wonder if it will return to feed on the Sedums now they are coming into bloom. We might suspect that the warmer summer of 2014 has been favourable for butterflies as we have seen the biggest numbers visiting at any one time in all my gardenwatching years (almost 8 now). Erysimum 'Bowles Mauve', a pretty big plant now, continues to flower its socks of in my sunny front garden attracting many butterflies. This has become such a garden favourite that I have added other plants in sunny spots around my back garden and it attracted the Comma to feed on this second visit too! Regular blog visitors will know I love to capture video of garden visitors and the Comma butterfly kindly cooperated by showing where its name came from… the comma markings on its underside! I’ve added a screen grab below for those not able to view the video. 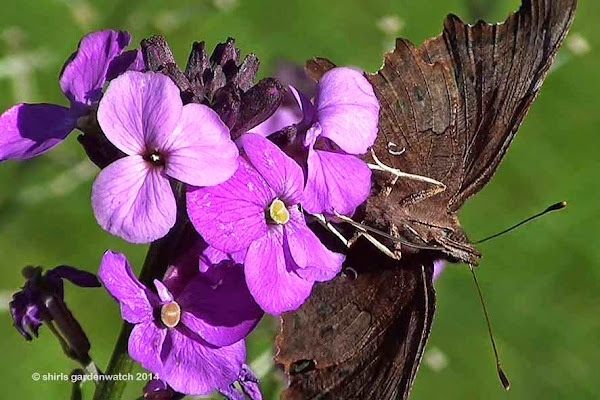 Short Comma butterfly video, 40 sec with background music, try HD quality. Prior to my Mum’s op we were on a family holiday (some new sightings there). Post op I've had spells staying over to help her (she is progressing well now). Copyright: Original post published on http://blog.shirlsgardenwatch.co.uk/ by blog author Shirley, September 10th 2014. How lovely Shirl. I'm so pleased the Comma stopped by to feast in your pretty garden. Oh what a lovely and poignant post Shirl. The Comma was waiting for You. I feel it. As always, such beautiful photos. Glad to read your mom is on the mend now. Beautiful photos! I am sure Dad is keeping an eye on you and your Mom. 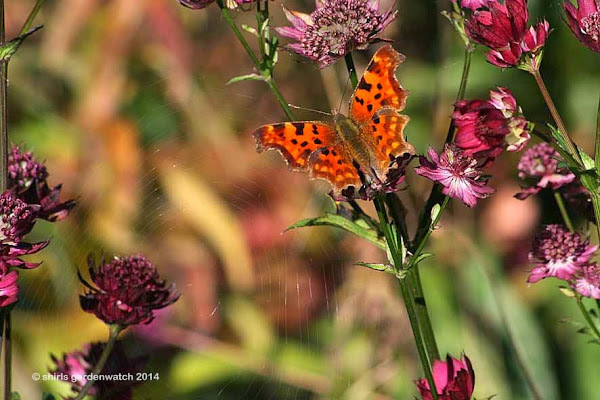 I loved to see this beautiful Comma butterfly in your garden. Fantastic shots of your Comma, we have seen an increase in numbers but of fewer varieties, this summer. This is the first summer that I haven't seen a Comma! We've had more commas and speckled woods this year but a distinct lack of peacocks which were abundant last year. In fact I don't think generally we have had as many butterflies this year. Maybe the poor August didn't help. How wonderful that your comma returned Shirl. Beautiful photos. I especially like the one which has captured the spider's web. Hope that your mum is making good progress and that you are soon able to spend more time garden watching and dreaming. Take care.